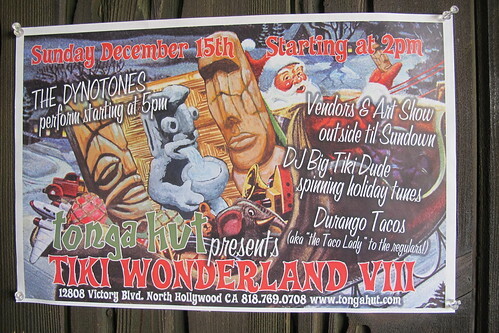 Last month, the Tonga Hut in North Hollywood hosted their annual Tiki Wonderland event with tiki vendors, art, tunes and tacos. 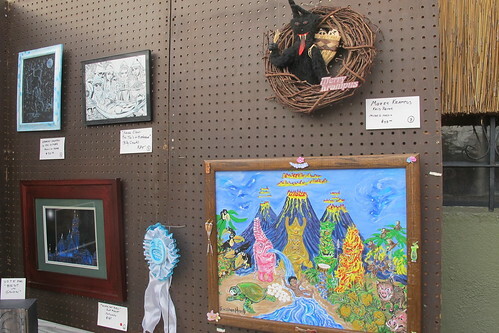 Mr. Hockey was a good sport and accompanied me, and I think he’s glad he did because the art show introduced him to Krampus. He loves the idea of this scary beast that kidnaps the naughty children at Christmas. 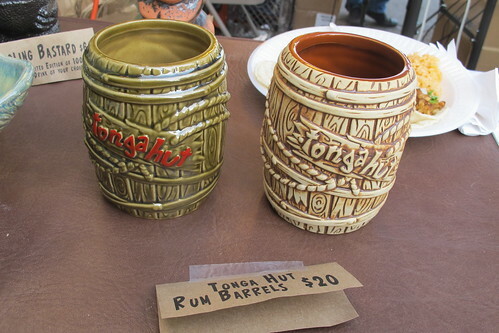 Tonga Hut had some new merchandise available at their booth, including a T-shirt collaboration ($20) with Vintage Roadside and signature rum barrel mugs produced by Tiki Farm in two glazes ($20). 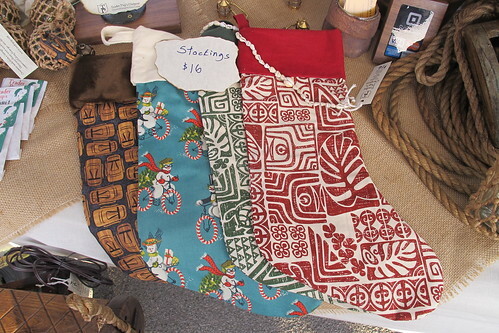 Meanwhile, Trader Pup’s Outpost had these neat tapa-style print stockings with shell necklace details ($16). I picked up the red and green ones to hang under my Bamboo Ben outrigger mug shelf in our tiki room. 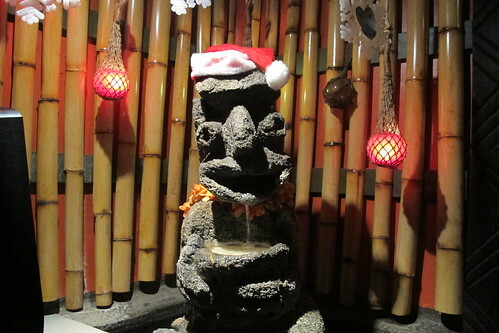 Polynesiac Jim makes awesome tiki ornaments (featured in last year’s Tiki Holiday Gift Guide). One of this year’s new designs was based on the “tiki babies” that come down from the Tangaroa tree at Disneyland’s Enchanted Tiki Room. 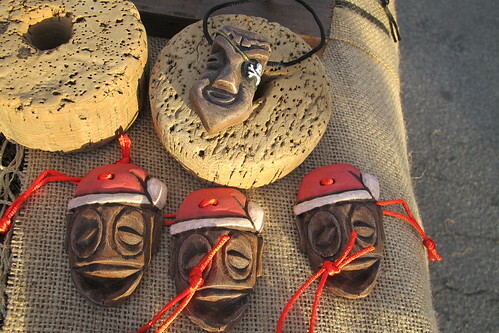 I also loved these Kon-Tiki pirate pendants! 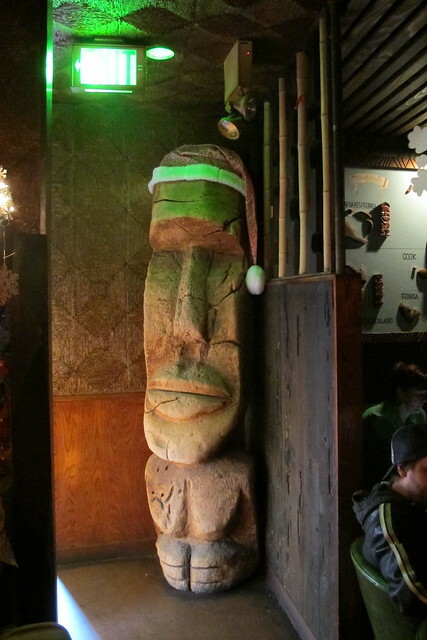 When Bahooka closed last year, they sold some of the decor during their final days but there was still a lot left. 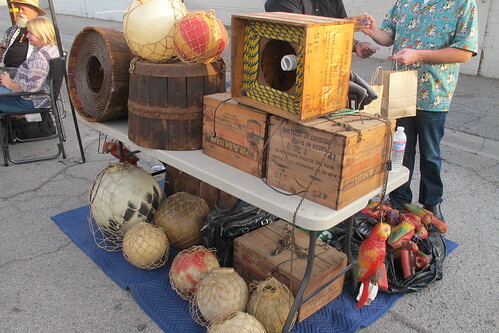 A tiki fan named Steve made a deal with the new owners to purchase all the remaining barrel lamps, plastic parrots and other things. He has a thread on Tiki Central where people can contact him about buying some of these Bahooka artifacts. I talked with him quite a bit and he seems like a real stand-up dude. 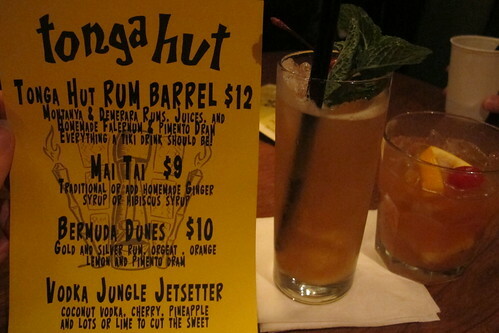 Great review, tiki chick. I was at Monsters and Mai Tais in October, but couldn’t make it back there inDecember for this, so it’s great to get your take and pics. Looking forward to more of your posts in 2014. Mahalo for the kind words, Finky! Polynesiac’s ornaments are indeed pretty awesome. Thanks for continuing to document the goings-ons!